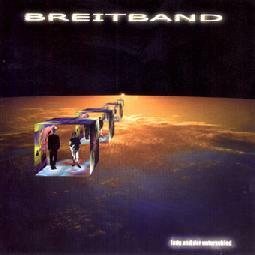 Breitband - "Fadu Und Der Unterschied"
Now this is an interesting disc. Breitband plays music that is typically heard from all-electronic works and indeed if I wasn't paying close attention and didn't read the liner notes I might think it was. But the instrumentation this German duo uses includes guitar, synthesizer, flutes, didgeridoo, kalimba, rainmakers, bells, jews harp, percussion, voice, and various found objects. Breitband's two members go by Dr. Oboti and PCMAN. The CD title is also the name of its two tracks which are 34 minutes and 40 mintues respectively. "Fadu" starts off as an eerie atmospheric piece with a haunting background, intermittent percussion bits, and what sounds like a droning didgeridoo. This is one of those musical journeys that takes many interesting twists and turns rather than concerning itself with any real thematic development. The band creates wonderful soundscapes and sequenced synth patterns along with all kinds of thundering ambient portions keeping the whole mood quite dark. I'm sure there is a lot of guitar work here that I'm not identifying, thinking it's a synth. The flutes embellish the music nicely, less as melody lines than as further contributors to the atmosphere. There's even a portion that recalls Gong with its chanting, musical droning, and tribal percussion. I was just waiting for the "ee'-ah-ho'-ah ee'-ah-ho'-ah". The mood gets uplifting near the end and a steadier paced rhythm kicks in, though we hear voices arguing and yelling in the background. "Der Unterschied" is similar musically but is much wilder, due mostly to the strange voices that sound like something off a mid-70's Residents album. Damned if I know what language it is but it sounds cool along with the droning space atmospherics. Of course there's lots of other voicings added to the mix making this quite the vocal track, though the voices have more of a collage quality and certainly aren't singing. We even get something of a full band sound when the percussion kicks in and the keyboards (guitar?) starts soloing in what sounds like it could be Porcupine Tree. Breitband has created a dark space journey that will take you on a bumpy, but ultimately safe trip to the furthest reaches of the solar system. We'll call it tribal soundscape electronica that's a bit on the psychedelic side and way out in space. Delerium also has a Breitband web site.